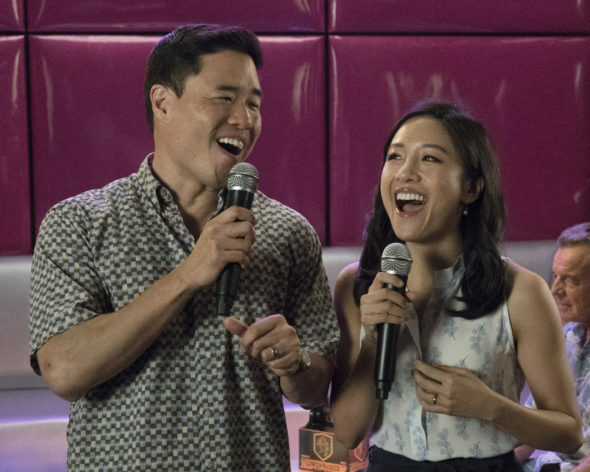 Are the Huangs sailing toward success, in the fourth season of the Fresh Off the Boat TV show on ABC? As we all know, the Nielsen ratings typically play a big role in determining whether a TV show like Fresh Off the Boat is cancelled or renewed for season five. Unfortunately, most of us do not live in Nielsen households. Because many viewers feel frustration when their viewing habits and opinions aren’t considered, we’d like to offer you the chance to rate all the Fresh Off the Boat season four episodes here. An ABC sitcom, Fresh Off the Boat stars Hudson Yang, Randall Park, Constance Wu, Forrest Wheeler, Ian Chen, Lucille Soong, Chesley Crisp, and Ray Wise. Set in the 1990s, the sitcom centers on Eddie Huang (Yang), his parents Louis and Jessica (Park and Wu), brothers Emery (Wheeler) and Evan (Chen), and grandmother Jenny (Soong). Now that they’ve been there for a few years, the Huangs have acclimated themselves to Orlando living. Still, they kick off the third season boarding with with Honey (Crisp) and Marvin (Wise), as they continue to pursue the American Dream. What do you think? Which season four episodes of the Fresh Off the Boat TV series do you rate as sailing, sinking, or just treading water? Should ABC cancel or renew Fresh Off the Boat for a fifth season? Don’t forget to vote, and share your thoughts, below. 5/11/18 update: ABC has renewed Fresh Off the Boat for a fifth season. Details here. More about: Fresh Off The Boat, Fresh Off The Boat: canceled or renewed? I love this show, so funny, please a fifth season!!!! I like the show and want it to continue. It’s very original and smart comedy. My favorite TV show! Love this show, keep it going. I am not Chinese, but find it very interesting what some of their customs are. But is seriously funny and we want it to keep going for a long time!